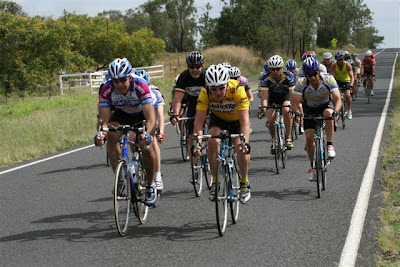 On Sunday the 18th of November about 20 of the Toowoomba Bikeliner’s came out to Dalby for a social ride. It was decided that we should do the “Big Loop” in a clockwise manner (taking the wind into account). For those not feeling up to the 65km loop there was the ‘Short Loop’ option, which is approx 42km. 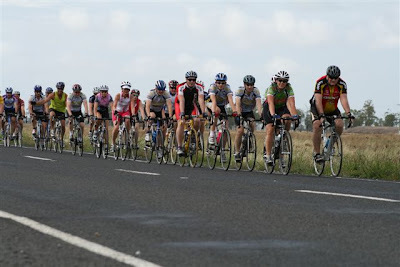 It was great to see all the riders heading out of town, full of colour and big group by Dalby standards. We were fortunate enough to have Vicki (Greg’s wife) on Sag Wagon duties in the Bikeline van should anyone need it, which they did, 2 flats for the day. The ride was enjoyed by most, some even missed Jimbour House, they must have been busy negotiating our lovely cattle grids. After the ride we were rejoined by the ‘Short Loop’ riders and family and friends to enjoy a tasty breakfast and coffees at The Oasis. Hopefully this is something we can do again some day soon. Thanks to Damo & Janelle for allowing the travelers to use their place for Rendezvous Point, also thanks to Team Photographer Donna for pics of the day.